So, I’m pretty sure I’m supposed to be annoyed that Apple wants to snuggle with me all day every day…but I actually love it! Though sometimes inconvenient, I find it incredibly precious that nearly every time I set her down she wakes up within about 5 minutes and cries…because it melts my heart when she’s completely content the second I pick her up! It’s just so wonderful to me that right now I can fix everything that’s wrong in her world just by holding her. Having 3 older girls, I know that all too soon they face bigger and bigger struggles and there’s less and less I’m able to immediately fix for them. Right now I’m able to make Apple feel perfectly safe and loved and happy, just by wrapping my arms around her (well, except for when she has gas or tummy troubles, then she just screams for awhile…but fortunately this time around that doesn’t happen too often). Yes, sometimes I need my hands free for other things, but that’s what my wrap is for (and why I made sure I had 2 this time around, so I can still wear her even if one gets dirty). Sometimes, too, I need my lap empty for Smiles and that one is a little more difficult to work out…but most of the time Smiles is ok with sharing my lap so long as she gets her share of Mommy snuggles. And yes, when we’re co-sleeping and Apple wants me to keep one hand on her most of the night I occasionally get uncomfortable and wish I could roll over…but if I could go back to when Apple was first born and I just held her non-stop and she got used to that, I absolutely wouldn’t change a thing. She’s my baby, I carried her in my womb for 9 months, and the second she was born I could barely stand for her to be anywhere but in my arms. Such a beautiful post. I loved holding my boys when they were newborns too. The urge was particularly strong with my youngest. Now that he’s 5 months old, it’s a bit harder, but I still love to hold him when he’s being still. 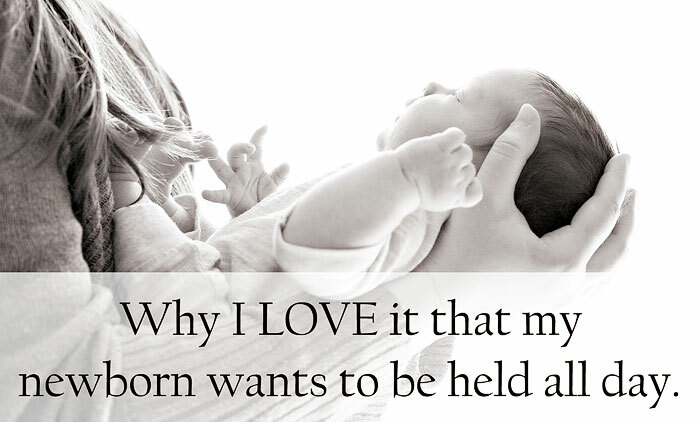 I miss little babies, if only I didn’t have to be pregnant to get them…..the pregnancy I can do without! Such a sweet post.